Rep. Ilhan Omar, D-Minnesota, sits with fellow Democrats on the House Education and Labor Committee during a bill markup on Capitol Hill in Washington, March 6, 2019. 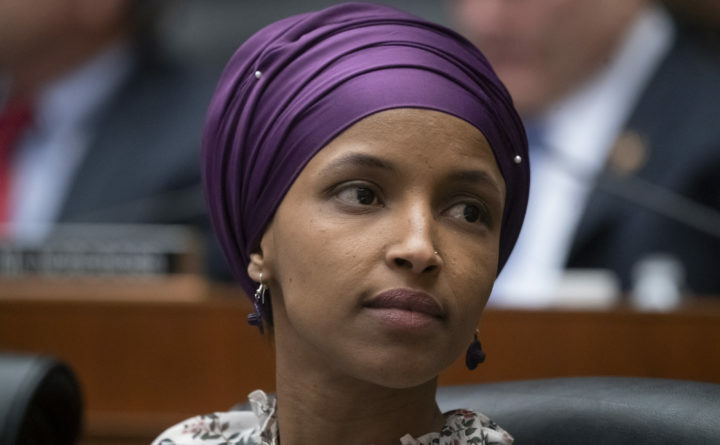 President Donald Trump is weighing in on the most recent controversy involving Omar, retweeting video edited to suggest that the Minnesota congresswoman was dismissive of the significance of the Sept. 11 attacks. As President Donald Trump has faced withering blowback over a Friday tweet that used video of the twin towers falling on 9/11 to launch a broadside against Rep. Ilhan Omar, D-Minnesota, many have argued that the visceral imagery could inspire more violence aimed at one of the first two Muslim women in Congress. Omar’s warning, which came hours after House Speaker Nancy Pelosi, D-California, revealed she has asked the U.S. Capitol Police to increase protection for Omar, adds new urgency to the demands for calmer rhetoric from her critics, who have repeatedly charged her with anti-Semitism and now with downplaying the 2001 terrorist attacks. The latest political firestorm around Omar centers on a speech she gave March 23 at a Council on American-Islamic Relations banquet. As The Washington Post’s Glenn Kessler reported, her talk drew little attention until a controversial Australian figure tweeted a clip of her using the phrase “some people did something” when describing the 9/11 attacks. “@IlhanMN’s life is in danger. For our colleagues to be silent is to be complicit in the outright, dangerous targeting of a member of Congress,” Rep. Alexandria Ocasio-Cortez, D-New York, tweeted shortly after Trump’s missive.